The Kleine Scheidegg, a mountain pass that connects Grindelwald with Lauterbrunnen. 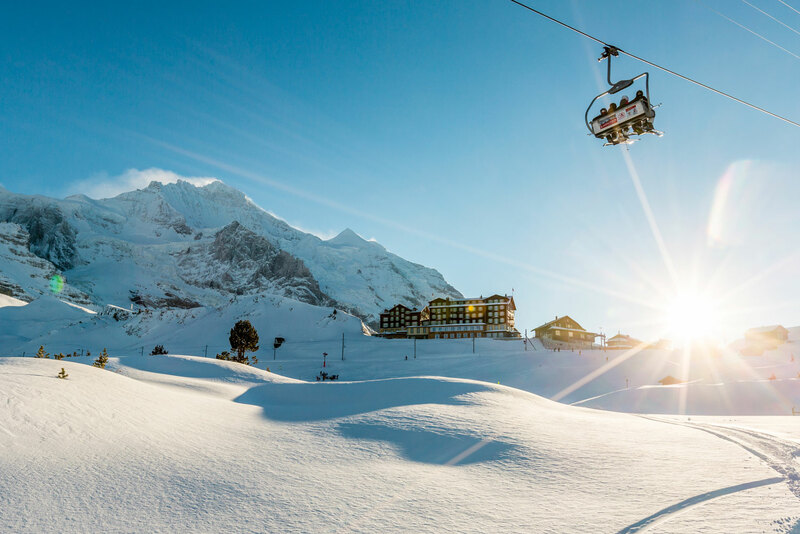 For some of the most picturesque ski resorts on the planet and perfect conditions, head to the Swiss Alps. The Swiss winter promises beautifully prepared slopes, cross-country ski trails, winter walking paths and toboggan runs with dramatic 4000-metre peaks for a backdrop. In the evening, enjoy a tasty fondue or relax by the open fire in your romantic chalet or cosy hotel. The village of Grindelwald in the Bernese Oberland has all of the above: it’s surrounded by a commanding mountainscape with the Eiger north face and the Wetterhorn. The ski area offers 160 kilometres of pistes with 30 lifts reaching up to an altitude of 2500 metres. Choose from 80 kilometres of winter walking trails with views across seven soaring peaks and majestic glaciers, as well as 60 kilometres of toboggan runs, including one of the longest toboggan runs in the Alps from the Faulhorn into the valley.